I had been looking forward to dining at The Modern for quite some time now. From the outside, you can’t tell much. Its entrance almost blends into the other buildings were it not for the menu, glowing and hanging by itself. Walking in along the curved lighted corridor, you definitely get the impression that the restaurant is an extension of the museum just steps away. My friends and I arrived promptly for our 8pm reservations on a Tuesday night and were seated shortly thereafter. As we were led past the bar room, I couldn’t help but notice how busy and lively the atmosphere was. Just around the bar room is the spacious dining room. Enormous floor to ceiling windows occupy one side of the dining room, overlooking the sculpture garden. I was pleasantly surprised that hardly any of the energetic noise from the bar room could be heard around the corner. Vibrant green and deep purple flowers nicely complemented the white decor of the dining room. After being seated, the sommelier was very knowledgeable and helpful in recommending a nice Pinot Noir given my taste preferences and price range. The bread came in a nice transparent glass ‘seashell’, accompanied by 2 types of butter (typical yellow butter and a delicious white goat cheese butter) sitting on their own marble slabs. Unfortunately, the bread was too hard and did not have much taste. And while the presentation was nice, it was annoyingly difficult to cut into the butter with them sliding everywhere on the marble. We decided to go with the 4-course prix fixe for $98 on this particular night. To our delight, we were brought not one, not two, but 5 amuse bouches. The first two consisted of a nice citrus-y crudo and a cube of goat cheese covered with something crunchy that tasted familiar but I cannot recall now. Both were pretty good. Unfortunately, none of us were fans of the third amuse bouche. Popcorn with hints of citrus tasted almost like fruit loops, something I prefer not to think of during a nice meal. However, next was a light but flavorful soup with pomegranates served in a test tube. Very creative presentation, but I personally felt that a nice shot glass instead of the test tube would have made it easier to drink and enjoy. Lastly, we enjoyed a skate terrine in saffron broth with a squid ink marshmallow on the side. The marshmallow was a small squishy burst of flavor. To start off my prix fixe, I chose the diver scallop, yellowfin tuna, and scottish salmon dish. All the seafood was fresh and well-seasoned differently. A solid dish, but nothing spectacular. Next, the Long Island duck and foie gras ravioli was by far the best dish of the night. Rich foie gras with tender chunks of duck tucked inside a nicely wrapped ravioli, paired with earthy black truffles, made for a savory and delicious second course. I wish I could have had 4 courses of just that. For my third course, I went with the crispy veal sweetbread and veal tortellini duo. The sweetbread had a nice texture with the added crunch, but the tortellini was quite bland and lacking in flavor. It just seemed like a lifeless glob stuffed inside a fried outer coating. The dessert portion of the night started with the fourth course, mango craquelin. Everything on the plate worked together, but I can’t say anything stood out in particular. I mentioned dessert started because after we were done with the fourth course, a cart full of almost every chocolate imaginable came rolling around to our table. Different flavored chocolate pieces, chocolate ganache, chocolate mousse, chocolate lollipops, etc. You name it, they had it. And after you were done satisfying your sweet tooth, everyone received their own little ice cream cone! If that weren’t enough, the ladies at the table were given boxes of buttery chocolate-filled cakes before leaving. As with other Danny Meyer restaurants, service was very good. Presentation was top notch and very artistic. All the extra amuse bouches and desserts were a nice bonus, but in my opinion, unnecessary. I almost felt that they distracted from the main courses. Overall, food was disappointing (with the exception of the ravioli). I expected something phenomenal for the price tag on the meal, but left disheartened. There are very few places in NYC that are worth returning to, but this one easily makes the list. I have eaten at Clinton Street Baking Company multiple times, and have never left disappointed. That’s saying a lot for someone who’s not a big fan of brunch. Because this restaurant is so small, expect to wait at least 30 minutes on an off-peak weekday, and around 1.5 hours on a weekend. You can pass the time by putting your name down on the list and exploring the area, but I would actually suggest loitering outside and sneaking in on the off-chance the names ahead of yours are not around when called. 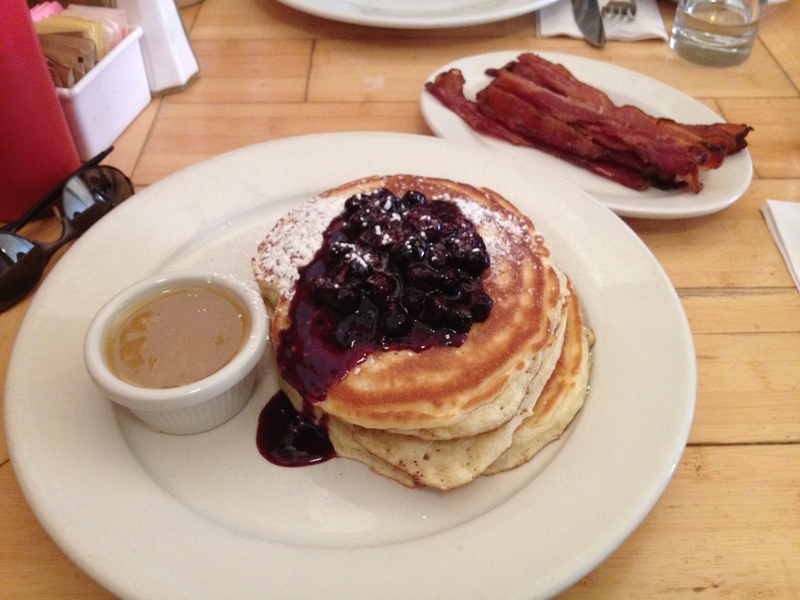 Take it from me, the blueberry pancakes with warm maple butter are HEAVENLY. This is the stuff dreams are made of. When the thick but fluffy stack of 4 large pancakes covered with fresh blueberries comes out, you start drooling uncontrollably. No need for a knife, your fork easily slices through the mountain of gold to reveal more hot and gooey blueberries cooked directly into them. As you pour (or dip, your preference) the warm maple butter over the pancakes and take your first bite, you are instantly transported into pure bliss. The pancakes simply melt in your mouth and the warm maple butter is like liquid crack you just want to chug. Throw in some sugar cured bacon and you get the perfect balance of savory sweetness. Nothing is quite like it. Expect slow service even after waiting forever to get seated, but it’s all worth it. Clinton St Bakery’s generous portions are consistently delicious. I will definitely be back once my craving for pancakes creeps up again. The banana walnut pancakes are good, but I don’t think they can compare to the blueberry. Also, I prefer the sugar cured to the double smoked bacon. First off, I love the ambiance of a garage turned into a restaurant. It gives the place a casual yet trendy enough feel that you could take a date or your family. While waiting at the bar for the rest of my party to arrive for our reservations, I enjoyed the diverse yet reasonably priced wine and drink menu as I downed a cold craft wheat beer. We were able to dine on a mild march night when the garage doors were raised so that everyone could enjoy the fresh night air. To start off the meal, we shared the calamari appetizer. The calamari was tender and cooked nicely. It would have paired perfectly with the greens, chilies, radish, and chickpeas had the dish not been overly acidic. I felt that the acidity overpowered the lightness of the entire dish. Next, we ordered the chicken, gnocchi, and risotto, with a side of potatoes. I must say, even knowing the hype around Jonathan Waxman’s chicken, I was not disappointed. The flavorful yet thin and crisp chicken skin with salsa verde added a lovely texture to each bite. I normally do not order chicken at restaurants because it can be easily overcooked and frankly, I can cook it well enough. However, there is no way (yet) that I could reproduce meat that was as juicy and tasty with perfect skin as the one I had eaten. As for the gnocchi, I will admit I am no expert, so I will just say that the few bites I had were pretty good. My friend thoroughly enjoyed it, but I wouldn’t go as far as to say it was very memorable. I personally preferred Babbo’s gnocchi, a lighter, softer, more airy version. Unfortunately, the low point of the meal came in the form of the risotto. The rice was undercooked and a bit crunchy to the extent where we were debating whether or not to send it back. The only acceptable aspect was its sauce, but that itself could not redeem the dish. The potato sides were fried pretty well and still had some good sized chunks of potato. You can’t really go wrong with fresh rosemary and potatoes. For dessert, we shared a canoli and chocolate pudding. Both weren’t bad, but they were nothing special. Portion sizes at Barbuto were very good. We could have actually done without the sides, but I’m just a glutton so we ended up finishing everything. Given the ratio of waiters/waitresses to customers, the slightly slow service was expected. We were also given a nice red wine recommendation by our waitress to go along with our meal. One last note is that the half-open kitchen is always a nice touch. I was able to see chef “Obi Wan Kenobi” himself moving about the kitchen. Overall, Barbuto just met my expectations but did not provide much in terms of surpassing them. I would come back as I liked the atmosphere and most of the food, but I’ll probably stay away from the risotto. I recently dined at Strip House Steak House with reservations on a Thursday night around 7pm. My friend and I were looking forward to Striphouse for a while since it is always highly regarded in the conversations around best NY steakhouses. In our opinion though, Striphouse was very disappointing and lacking in not only the food, but the service and ambiance as well. Even with reservations, we were seated in the bar area instead of the main dining area, which was unappealing for a couple reasons. The noise level in the bar area was very lively, as expected, but not what you want during a dinner. Also, the bar area was uncomfortably cramped. Every time you shift around in your seat or move your arms to cut a piece of steak, you feel like you’re going to bump the person behind you or trip a passing waiter. The meal itself wasn’t terrible by any means, but it definitely wasn’t memorable in a good way either. Our waiter did well to take our drink orders, then gave us ample time to look over the menu and tell us about the specials. We passed on the appetizers this time around as nothing quite stood out. I will add that we usually go for steakhouse bacons; however, there was never enough buzz around Striphouse’s bacon to warrant a go at it, especially after you’ve had Luger’s, Wolfgang’s, and Del Frisco’s. For our entrees, we both ordered medium-rare 20 oz. bone-in NY strips (the cut that Striphouse is supposedly known for). The steaks arrived with perfectly crispy chars on them that deceivingly promised an equally tasty treasure laying inside. Upon cutting into the steaks, my companion’s meat was more rare than medium-rare, whereas mine was a nice warm red medium-rare. One of our biggest gripes with the steaks was that they were not tender enough to compare with the other top steakhouses. If it normally took 3 cutting motions there, it took 5 here. We felt that we spent more time and energy cutting than enjoying. To add to the disappointment, our steaks were showered with an overly-generous amount of salt. Don’t get me wrong, I love a nice salty and well-seasoned steak, but when the salt crystals overpower the meat, that’s when you have a problem. I will say that the accompanying roasted garlic is a nice touch though. Based on the other reviews, we decided to go with the crisp goose fat potatoes and black truffle creamed spinach sides. The potatoes were deep fried on the outside, but provided nothing special in terms of flavor or texture. The spinach wasn’t as pureed (which I prefer) so you could actually see and taste more of the spinach leaves. Unfortunately, I could not taste that much black truffle in the dish. As with the steak, the potato and spinach sides were over salted, leaving us disappointed and thirsty. The last straw came when it was time to pay and our waiter even handed us the wrong bill. I understand that it’s busy, but a quick glance at a $540 bill for a party of 2 should have set off some bells that something was amiss. He expressed his apologies and fetched our correct bill, but still, this sort of mix up should never occur. Overall, it will be a long time before I would consider coming back to Striphouse. Over-salted food coupled with less than great steaks led to a disappointing experience. For the same price, there are other NY steakhouses that offer better food and service. I had the pleasure of dining at North End Grill for lunch on a Monday of a holiday weekend. With reservations at noon, it was not busy at all so I basically had the choice of any seat in the restaurant. I opted for the open kitchen counter since you’re able to see the food being prepared, cooked, and assembled. Obviously it’s not quite the same experience of sitting at a sushi counter, but the experience was still great as you feel like you’re part of the kitchen and can strike up conversations with the chefs at any time (i.e. the grill master in my case). As mentioned in many of the previous reviews, the service was phenomenal. My waiter was very knowledgeable regarding the menu, guiding me through the standouts and taking my preferences into consideration. I saw the head chef Floyd Cardoz numerous times throughout my meal walking around the kitchen inspecting the food being prepared, giving me the assurance that the food I was eating was how it was supposed to be. Chatting with the grill master, I was able to find out the more popular dishes and his recommendations about the newly added entrees on the menu as well. The manager even stopped by at one point to say hello and make sure I was enjoying my meal. I re-iterate, service was top notch. Moving onto the most important part of the review now…simply put, the food was delicious. Each bite of the cod throats appetizer (as recommended by my waiter) was extremely tender and juicy. This was my first time eating cod throats, but it will definitely not be my last. The sauce underneath was tasty and did not overpower the dish. But the only complaint I have was that the lightly fried coating was on the salty side. For my entree, the grilled sea bream was bursting with flavor in every mouthful, paired nicely with a crisp Greek white wine by my waiter. The salsa, cabbage, and bacon each added a new dimension to the perfectly cooked fish. Even with the abundance of flavor, the spotlight of the dish was still on the fish. Finally, for dessert, the butterscotch pot de creme did not disappoint. Personally, I could eat the single “maltmallows” that topped the dessert all day. Subtle hints of aged whiskey in medium fluffy marshmallows are to die for. I’m not normally a fan of desserts because they are too sweet, but the chocolate streusel mixed with the butterscotch creme was decadent. And for those with a sweet tooth, if you dig a little deeper, you’ll find a sunken treasure pocket of caramel to sweeten the deal. Overall, North End Grill is not perfect, but is on a very good track. Service is exceptional. Food is delectable, with just a bit to iron out. I will definitely be back to try the rest of the tempting menu. One unfortunate note to add, but will not be held against them in this review, is that I did notice a few dishes ready to go out, sitting idle and cooling for 5 minutes or so. With more new employees coming in and given this establishment is still relatively new, I have no doubt these small kinks will be addressed.